Since rediscovering the joy of sewing, I wanted to share my pleasure with others. Maybe you, too will begin a new quest, whether it is in sewing or another endeavor. Life is so much more interesting when it contains a creative activity! 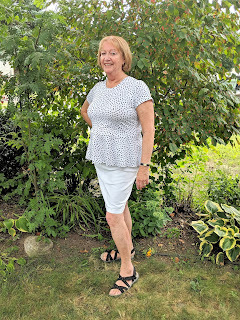 I was very pleased to be chosen to test the women's Relaxed Top and Tunic from Mama Can Do It. This pattern is designed for knit fabrics, and comes in a top length as well as a tunic. There are several options for the peplum including a gathered skirt, a full circle skirt, and a half-circle skirt. I decided to make the half circle skirt in the top length. Since I wear short sleeves year round, that was what I made, but there is also an option for long sleeves. This pattern comes together very well. The instructions and illustrations are clear and to the point, with the various options outlined clearly. There is even information on how to best grade between sizes. There are two pattern pieces for the peplum, two for the bodice, and the sleeve and neckband pieces. A confident beginner would be very successful in completing this pattern. 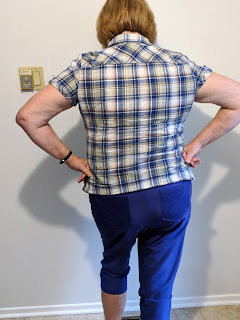 When I saw the Mama Can Do It Fit Pants pattern, I knew right away that I had a fabric that I wanted to use to make capri pants with a yoga waist. With fingers crossed, I dug it out of the pile and checked the stretch. Luckily, it had the required 50% stretch, but only a two way stretch. I wasn't sure of the fabric content as I had been hoarding this lovely purple for a while, but I plunged right in. I carefully cut out the skinny version sticking to the yoga line. After I cut out the waistband, I decided to test it out. Oh, dear - not enough lycra (if any) and the waistband wouldn't go around my waist. I considered using a cotton/lycra waistband, but none of my purples matched, and I couldn't handle the thought of a contrast waistband, so I decided to make it work, one way or another. Mamma Can Do It has hit it out of the park with this pattern for pants which is available for both women and girls. 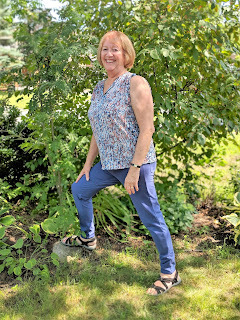 This is a versatile pattern which includes wide leg, flared, straight, and skinny pants, as well as cut lines for shorties, mid thigh shorts, knee length, and capris. There is an option for a yoga waistband or an elastic one. Oh and better still, there are three different pockets included: hip pockets, and back pockets either with a triangular point (like traditional jeans), or square. Whew! There really are that many choices. Seriously, you can make whatever type of pants you prefer, all from one pattern. Well, I'm afraid I have been neglecting this little blog. I have certainly been doing tons of sewing, but somehow, I haven't been busily writing about my accomplishments. 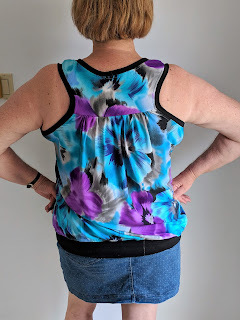 It's back to business today with this post about my newest tank top, the Spoxxy from Stitch Upon A Time (SUAT). I am showcasing the back of my top as this is the pzazz of the Spoxxy, which is a great tank top and dress from Stitch Upon a Time. This pattern has just been updated and now includes layers, as well as a dress version. I decided to upcycle a maxi skirt that I made last year in this ITY. While I love the fabric design, it was just too heavy as a skirt, but it's awesome as a Spoxxy. This is a quick sew which can be made start to finish in about an hour and a half to two hours, depending on your skill level. The only tricky part is attaching the gathered back to the yoke. As long as you go slowly and use tons of clips or pins, it will be just fine. "Back to school" It's that time of year when many are thinking about outfitting their children for their new school year. 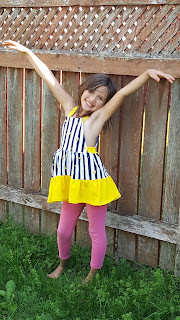 You can't go wrong with the newly released Gold River Adventure Dress from Goober Peas Designs. This is a great outfit to sew and makes a very professional product with great seam finishing. This is an overall style dress, available in sizes from 3 months to 12 years, with many options for the skirt, including straight, gathered and two or three tiered. The bodice is common to all versions. As always with Goober Peas designs, the instructions are clear and easy to follow. I made the version shown here in a knit, but it can also be made with woven fabrics. The two tier version makes a perfect length to wear with leggings, and is just as cute from the back. I was recently fortunate to be chosen as a tester for this gorgeous retro blouse and dress from Itch To Stitch. With it's slightly gathered sleeves and bodice, along with a waistband and flowing skirt, this dress and top are reminiscent of the seventies, but with a very modern vibe. The shirt and dress include a collar on a proper collar stand, but don't let that scare you! The instructions are very clear, with a step by step technique that will help to ensure success. Similarly, the waistband comes together very nicely and looks great in a contrasting fabric, too. I chose to change the direction of the pattern for my waistband, but that is not necessary to do. Denim - It's All in the Details! As a child of the 60's, I have always been a huge fan of anything denim: jeans, skirts, dresses, cut-offs, and even hats. The Sandbridge Skirt by Hey June Handmade brought back my love for denim, as soon as I saw the line drawing for the tester call. This is a great skirt! 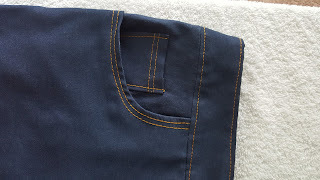 It comes in two lengths (mini and knee length), and it has all the bells and whistles denim clothing should have, starting with a fly front, a coin pocket, optional rivets, contrasting bias for the inner waistband and topstitching details on the seams and pockets.